I don’t know what it is about top ten lists, but I love them. Put ten items on a list, and I’ll read it. (Maybe I watched too much David Letterman in my younger years.) As you may imagine, Time Magazine’s The Top 10 Everything of 2010 has me in list heaven. End-of-the-year lists are the best, and this one is a very comprehensive compilation. If you missed Frankenfish, Release the Kraken, Jon Stewart v. Rick Sanchez, A Visit From the Goon Squad, The Vatican and Homer Simpson, Sing-a-ma-jigs, and the completion of the world’s longest tunnel, you’ll find them all here. And more. Much, much more. 9. Twitter/email/ blog comments. They’re short communications, yes, but it’s a cumulative thing. 8. The Sunday Crossword. I justify spending half the day on it by telling myself it will delay my dementia. 7. A&E’s reality series Hoarders. It’s horrifying and the worst kind of TV voyeurism. But it has redefined how I feel about my stuff. 6. Exercise. I like to exercise. I do. But an hour a day takes up a lot of time. I want a machine that will move my limbs while I sleep. And a bigger bed, for my husband’s sake. 5. Daydreaming. I hang out in my own head a lot. Sadly, there’s no clock there. 4. Reading. This is imperative for all writers. But I can’t write while I read. If you’ve figured out how, let me know. 3. The internet. From cutting-edge science to Cakewrecks…the internet is quicksand for my brain. 2. Food Shopping, aka “good heavens, didn’t I just buy cereal?” Despite my best intentions, we’re always out of something. 1. Talking to my sons. I’m sure I was not nearly as interesting when I was a kid. 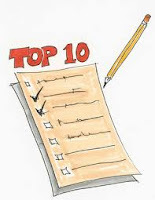 What’s on your Top Ten List for 2010? Yes on 10, 9 and the Internet (forget what number that was). Also cooking dinner, exercising the dog (and myself) and Solitaire on the iPhone (which is the root of all evil, I've decided). Felt kinda strange when I realized that some of the boondoggles are a two-edge sword. They can help with my writing as well as be a time-sink. The only one I'd add is sleep. Sometimes I really need to get a good night's sleep. I know what you mean, Kay. Sometimes it's not an either/or thing. Nice top ten lists like it. I have not still figured out any such list but now I have to think about it. Yes I do the same thing regularly but not as per list so I just have to give appopriate No. to them. Thanks for sharing this. Joy, I'm lucky to have avoided the crime show addiction, but my Netflix queue is trouble! Hily, thanks for reading and commenting. Good luck with your list! On my top 5: d bar, Inception, my kids, dance offs, & 5 extra minutes of sleep. Bottom 5: my dog, revision, b-rate boy movies, hangnails, & scissors (my kids keep cutting their hair).